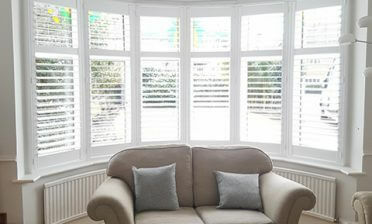 We were back in our local area of West Wickham, Bromley to fit some shutters to an interestingly shaped bedroom window. The Window was an L-shaped bay window which curved around to the right, a great shape of window to build out bespoke shutters around! 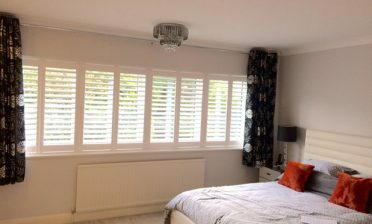 Our shutters will help to transform this bedroom and also the look of this 1930s home from inside and out. The client previously had curtains in this area for many years, but was looking to create a better look as well as a solution that is easier to maintain and clean. Material curtains can harbour all types of dust that is hard to spot and clean off. 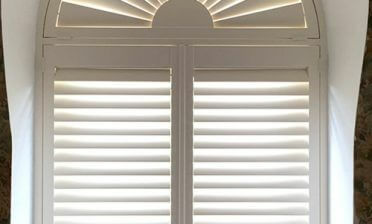 With our shutters it is a case of simply wiping clean with a duster or wipe whenever necessary. 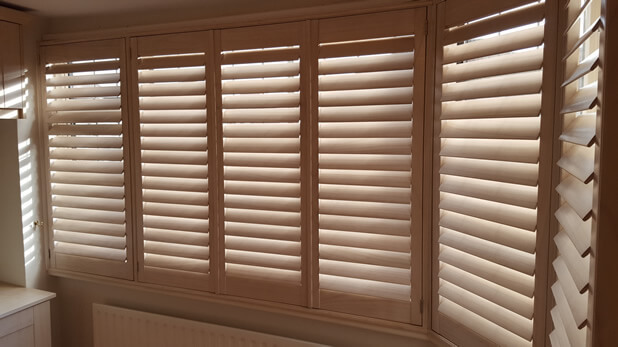 We created the shutters from our Fiji Range of hardwood, custom creating the shutters to fit millimetre perfect around the curved L-shape of the window. 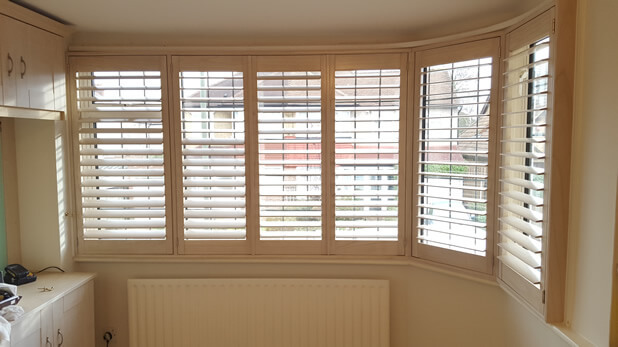 After talking with out experts the customer also opted to have a hidden split midway in the shutters which allows for the louvres to be adjusted separately at the top and bottom without using a physical mid rail, which helps create a minimalistic clean look to the shutters. 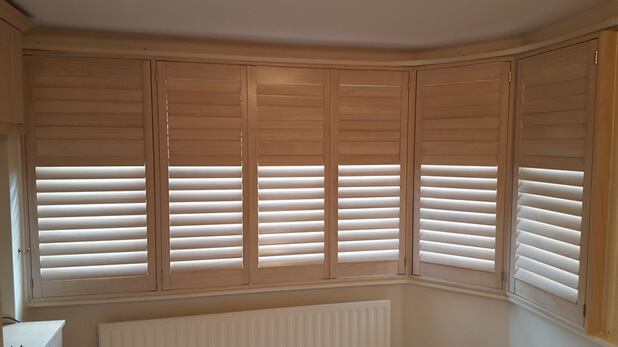 Interestingly with these shutters we finished them in a lime white colour which allows the grain and wood colouring of the paulownia wood to fully show through, rather than using a standard paint colour over the wood. This effect can only be achieved with our Fiji and Sumatra ranges. The shutters were then finished off with some stainless steel hinges to match fittings throughout the room. This installation was carried out by our fitting technician Mike who did a wonderful job!